It is wonderful to see how in a short time children and young people are able to explore new creative processes. The colorful art works are the result of this process and are more than a reproduction of previous works they have made. It is not easy to follow new routes in making art, but it is characteristic for art to be able to look permanently for undiscovered routes. To find a personal way of expression a wide range of them has to be explored. Young people are capable to enter time after time new fields to discover its challenges. During the workshops art from artists like Paul Klee, Matisse, Hundertwasser, and others is used to show the relation between subject and background. Every session has been introduced with instructions in the field of the use of the paint, the composition, color and so on. To start from a well-known way of working helps to find some self-awareness in reflecting on the subject. The natural materials found in the yard of camp are their own selection and as usual it gives an impression of their interest and expectations. By making a composition out of these flowers, leaves and branches they get a view on the shapes, colors and sizes of the found objects. The first drawing is trying to make a 'copy' of it, but after that the research has to go further. How can these elements be visualized in different ways? This is a task that is endless and has many, many ways to follow. The graphite pencil (2B, 3B or 4B) delivers the color, which is reduced to black in different grey levels. To find out how to use these grey levels in the drawing takes time and experiences. The nuances of grey can be used selective, e.g. to create light grey by adding darker grey to it. In this series of workshops the drawing took one session. 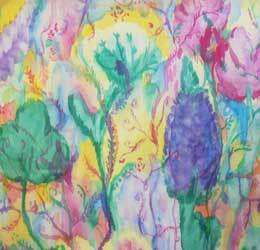 The second part of the art workshops has been focusing on creating a composition of natural objects in paint on fabric. The acrylic paint is offered in a liquid form and in separate glasses with a round soft brush (as by aquarelle). It is the intention to work in different layers with time in between to let the paint dry. As expected the objects were painted first as it takes time to realize that they are working on something which finally has to be a whole. When you are thought to build up an art work detail by detail it is not easy to leave that behind you, still it is possible to rearrange the automatic way of working. The next step is use the background as part of the total painting. It is possible to create new colors and new shapes out of the existing ones. It is great to see how new elements come into the work, sometimes as a 'mistake', sometimes as a 'trial' and most of the time by taking a risk. In the last layer it is possible to make details or to put new shapes over the existing ones and slowly enter the final cohesion of this process. It is wonderful to see how different the works are and how the individual handwriting creates a personal imagination of the view on the original objects.